Cumulative Update – 5 for SQL Server 2012 Service Pack 2 Is Now Available ! April 27, 2015 10:50 am / 1 Comment on Cumulative Update – 5 for SQL Server 2012 Service Pack 2 Is Now Available ! The 5th cumulative update release for SQL Server 2012 Service Pack 2 is now available for download at the Microsoft Support site. Cumulative Update 5 contains all the hotfixes released since the initial release of SQL Server 2012 SP2. Cumulative Update – 15 for SQL Server 2012 Service Pack 1 Is Now Available ! The 15th cumulative update release for SQL Server 2012 Service Pack 1 is now available for download at the Microsoft Support site. Cumulative Update 15 contains all the hotfixes released since the initial release of SQL Server 2012 SP1. Cumulative Update – 7 for SQL Server 2014 RTM Is Now Available ! The 7th cumulative update release for SQL Server 2014 RTM is now available for download at the Microsoft Support site. Cumulative Update 7 contains all the hotfixes released since the initial release of SQL Server 2014 RTM. Those who are facing severe issues with their environment, they can plan to test CU7 in test environment & then move to Production after satisfactory results. In Windows 2003 failover clustering, Cluster nodes continuously putting details in log file on each node. This log is in readable plain text format & located in %SystemRoot%\Cluster folder on each node in the cluster and the name of the file is CLUSTER.LOG. In Windows 2008, One of the major change is cluster logs logging. Microsoft change the logging mechanism & now cluster logs logging also work as per rest of Windows handles event logging. The legacy cluster.log file no more exists. In Windows 2008 the cluster log is handled by the Windows Event Tracing (ETW) process. This is the same as the System or Application Event logs you view in Event Viewer. 2. The log files are stored in an *.etl format. 5. The default size of these logs is 100MB each. You can change it as per your requirements. 6. We can have maximum 3 *.etl files. 7. The ETL.001 file is the active file being used by the live cluster service to write debug entries. 8. File rollover happens only on reboot. On reboot, new ETL.001 will be created & last file will be deleted. 9. In case, Latest ETL.001 file reach to MAX size, Data inside the file will start truncating on basis of FIFO (First In First Out). But file rollover happen only on reboot. èHow to check cluster properties ? èHow to change the MAX size of cluster logs ? èHow to Generate a Cluster Log in readable format ? Default cluster log level (ClusterLogLevel) is 3. Which is same as windows 2003 logging. You can have max level 5 to have more detailed information for analysis. Using higher level of level may impact system performance as well. How to restore Master database – SQL Server System Database? 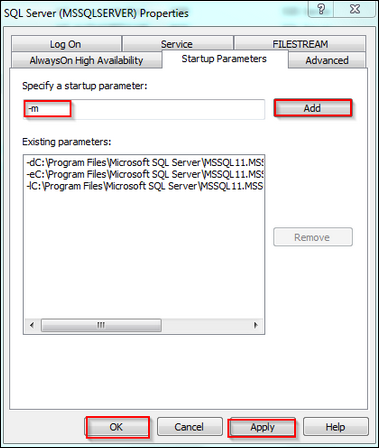 Parameter [-m] Starts SQL Server instance in single-user mode. SQL Server in single-user mode can connect with single user only and did not start CHECKPOINT process. Starting SQL Server in single-user mode enables any member of the computer’s local Administrators group to connect to the instance of SQL Server as a member of the sysadmin fixed server role. Processed 352 pages for database ‘MASTER’, file ‘master’ on file 1. Processed 2 pages for database ‘MASTER’, file ‘mastlog’ on file 1. The master database has been successfully restored. Shutting down SQL Server. SQL Server is terminating this process. 5) After Master DB restore, You SQL services will be shutdown. 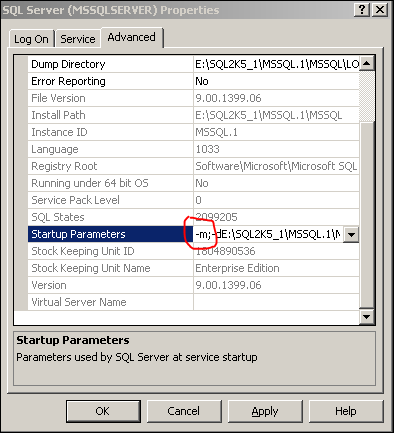 Start SQL Services in normal mode by removing [-m] parameter. 6) You are done !